A variety of citrus rarely found outside of Asia, yuzu is a classic ingredient in Japanese cuisine. Yuzu has a complex citrus flavor and floral aroma that pairs well with our refreshing blend of first flush green tea and matcha. We developed a unique drying process and blending technique that captures the fresh essence of yuzu without the use of added flavors. This entirely natural blend is refreshing and pleasantly sweet with citron flavor and offers an aroma of roses and geraniums. Ingredients: green tea and dried yuzu citrus fruit. / Origin: Shizuoka Prefecture, Japan. Click Here to read about our 2009 World Tea Championship winners! This morning…I am in the presence of greatness! That’s according to the World Tea Expo! 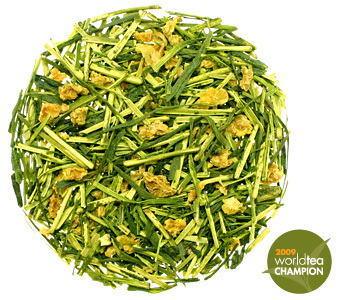 Rishi’s Sencha Yuzu also known as Yuzucha is a 2009 World Tea Expo Winner! I must say this is truly unique…and I like unique! It looks to have the powdery Sencha along with Yuzu pieces and lemon grass in the blend. The aroma is a lovely but not over-done citrus. I did two infusions of this. As suggested my first attempt – I infused for 2 minutes and it was great! I could taste the citrus and true green tea. It was a little vegetal and a little sweet and grassy but then also citrus! As for the 2nd infusion I also went with their suggestion of a minute to infuse and it was still very good – a very high quality solid green tea taste…sweet grass and vegetal, indeed. But the Yuzu Citrus Fruit Flavor wasn’t as bold as the first infusion. However, what I could taste of the Yuzu was still quite good. Both infusions seem to leave a toasted-nutty sort of taste which was unexpected yet tasty. I really like this offering and understand why it has won awards!